I think anyone who's a big fan of die cut dominant cards will "bee happy" with the card I'm sharing today! I rarely make cards that have more die cut elements than stamped and colored elements but there were so many great stand alone dies from the Honey Bee Stamps spring release I wanted to use. I started with an inked cloud sky backdrop made with the Cloud border stencil and some Peacock Feathers Distress Oxide ink. I die cut 4 branches from kraft card stock and lightly applied some Walnut Stain Distress ink for shading. I used the branches to create a frame for the bee hive. I die cut many leaves from some card stock I had colored using the ink smooshing method with Lucky Clover and Twisted Citron Distress Oxide inks. I then just randomly adhered the leaves to the branches. I die cut the bee hive from some sunflower yellow card stock. I added shading and fine line detail along with a few splatters of watered down Walnut Stain Distress ink. I added the hive to the center of the framed in area with foam adhesive. I did cut a small piece from an extra branch and added it the underside of the top branch to serve as the attachment point for the hive. The die cut sentiment is four layers of black card stock. I did have to cut an extra "e" to make the word "bee" because the original was just "be". If you've placed an order directly from Honey Bee Stamps in the last few months then you have gotten a free BEE with your order. I have place quite a few orders so I have several free BEES and have used them here. I think they are the perfect size to go with the hive die cut. To finish off my bee hive scene I added a stitched scalloped square frame made by nesting a scalloped square die and a double stitched square die. I kept my card base slightly smaller than the scalloped frame so all you see is the scalloped edge. 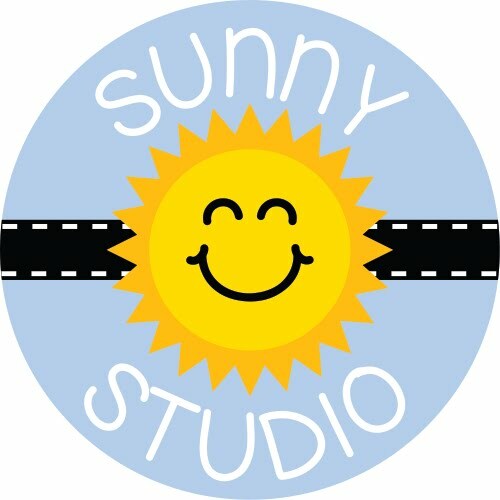 The finished size of my card is 5.5" x 5.5". Thanks for stopping by and have a bee-utiful day!! Hello and happy Wesdnesday! I'm over on the Hello Bluebird blog today with my very first design team post. I'm sharing a card featuring several stamps and dies from the May release so please stop by over there for more details. Have a great day! I have always had a fondness for ladybugs... anything ladybug. From the real thing to illustrations of ladybugs and of course ladybug stamps! Needless to say I love the Little Ladies stamp set from Honey Bee Stamps. I've used three of the ladybugs from the set on today's card. I kept my ladybugs pretty traditional in color and my go to for the ladybug wings is a cool toned red that borders on more of a red violet. The Copic combo I used to achieve this is - RV23, RV25, and RV29. I set the scene for my ladybugs by adding an inked cloud sky using this cloud border stencil and cutting out a grassy border from pattern paper using this Honey Cuts die. I custom built a sentiment using the Friends Like You stamp set. I also used one of the new Stitched Scalloped Square dies to frame up the scene. I added some finishing touches like glossy accents to the ladybug spots and a few dots of Nuvo glitter drops in Sherbert Shimmer around the sentiment. These Little Ladies just make me smile! ...and since the stamp set includes many different face options for the ladybugs, you can give them some fun personality that will be sure to brighten anyone's day! Hello Bluebird's 2018 May release is now available!! There are 7 new stamp sets (6 have coordinating dies) and 2 stand alone die sets. This fun new release is available for purchase in the Hello Bluebird shop. To celebrate the new release, I'm sharing a card I've made using one of the new stamp sets called Puddle Play. For this card I wanted to create an ink blended rainbow background with a text pattern. I used two of the sentiments from the Puddle Play set and stamped them repeatedly on an angle to fill the entire card front. I heat embossed the sentiments in white and then applied my ink over top. I used a rainbow of Distress Oxide inks and an ink blending tool to apply color following the same angle. Since this background is pretty bold, I used two layers of vellum cut slightly smaller than my card panel to arrange my stamped characters on. I found that two layers of the vellum was just enough to fade the background so my scene was very prominent but still allowed the colors and text pattern to show through. All my stamped images were colored with Copic markers. Don't forget to check out the Hello Bluebird blog for continued inspiration from the Design Team using all the new set from the May release. Hello Bluebird's May release previews are happening now and all new release stamp sets and dies will be available in the Hello Bluebird shop on May 17 at 7:00 pm MST. Today I'm sharing a card featuring one of the new stamp sets called Wildflower Bouquet. This is a 4" x 8" stamp set and it's loaded with solid flower and leaf images. A few of the flowers and leaves have additional layers to add some lovely detail. I wanted to create a very full bouquet of flowers that would cover most of the card front. I stamped multiples of each flower and leaf sprigs using Catherine Pooler inks. I have found her ink pads to be great for stamping large solid images. I started assembling the bouquet by laying down the greenery first in a starburst like shape. I then just starting layering the flowers on top. I wanted the arrangement to be very organic and somewhat loose. Much like you would get if you were picking wildflowers out of a garden and building the bouquet as you picked. I did add a little bit of white and dark gray splatters to the flowers. It's subtle but still adds a lot of detail and interest. 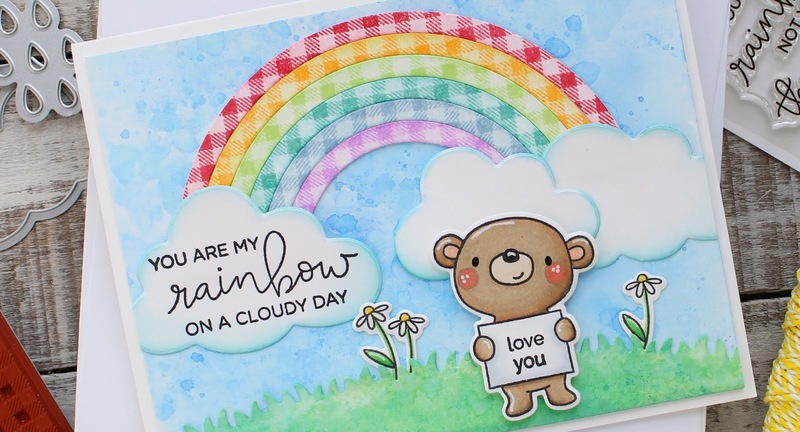 The sentiment - Just a note to brighten you day - is from another new HB set called Rainy Day and the hello die cut is from a stand alone die set called Gallery Frame die #1. Don't forget to check out the Hello Bluebird Blog for lots more inspiration from the design team! Hello!! today I'm sharing some really fun cards that I created using a new Honey Bee Stamps Honey Cuts die set. This new die set is so unique and has everything you need to create a large flower front and center on the square gate folding card base. For the white daisy card I used images from the Busy Bees stamp set to decorate the front and the inside. I also added some plaid pattern paper to the front behind the flower to make the white petals really pop. There is definitely a fun factor with how these cards open! It's a gate fold style opening with a twist. For the pink flower card I used some of the adorable ladybugs from the new Little Ladies stamp set. Really you can't go wrong with either bees or ladybugs for embellishing this big flower. Below I've included some photos and instructions on how to assemble the flower petal card - it's very easy to do! Also please note that this makes a 5"x5" square card and will need a 5.5"x5.5" envelope. There are online sources like Amazon and Paper Source to purchase this size envelope if you don't already have some in your stash. First you will need to die cut one card base and two half flower shaped bases. Then adhere each half of the flower shape using the tabs to the card base - one on each side lined up right along the edge. There are 5 different sized individual flowers petal dies in this set that give you many layering options for the flower. You will want to adhere all the petals down first before adding the flower center on top. There are two options for adding the center of the flower - you can leave the center whole or cut it in half. I've shown both ways in my finished cards above. I think both ways look fine but if you plan on cutting the center in half just make sure you've strategically placed the sentiment or images so they won't be cut in an awkward spot. I hope I've covered everything but if you have any questions please leave them in the comments and I'll be happy to answer them. Today I'm sharing two cards featuring the newly released My Tribe stamp set from Honey Bee Stamps. This large 6"x8" stamp set includes many very unique images and some pretty great sentiments for creating cards perfect for sending to those special friends in our lives! For this first card I used the large and beautiful border image from the set. I used my Zig Clean Color Real Brush markers to do some quick and easy coloring. I embellished it with a few tiny gems and applied a very light wash of aqua blue watercolor to the background. For the top half of the card, I created a decorative paper pieced band using the new Double Stitched Square Frame Honey Cuts dies. I nested two of the dies together and ran them through my die cut machine to get a frame. Then used just the corner sections of the frame to build the in-laid pattern in alternating colors. I stamped the sentiment on vellum with Staz On ink. I used Multi Medium Matte to adhere the vellum directly to the card by just dotting the glue lightly right behind the stamped sentiment. I found this to be the best way to adhere vellum with no adhesive showing through. I kept this next card very simple because the sentiment is everything and wanted it to be prominent. I heat embossed all the images and sentiment using Brutus Monroe Gilded gold ultra fine embossing powder. Again used my Zigs to add color to the images but this time used a water brush over the color to soften. I cut out the feathers using the coordinating dies and then arranged them in a slight curve to form a banner over the sentiment. I then stitched on the curve using my sewing machine and some gold thread. This set has so many possibilities! 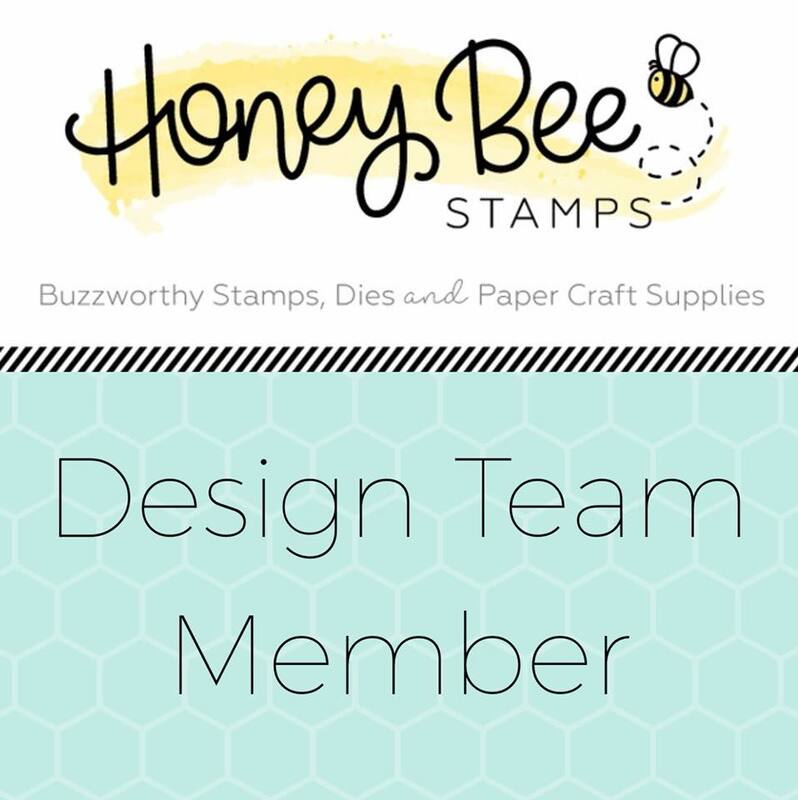 Be sure to check out the Honey Bee Stamps blog for continued inspiration from the design team using this set and more of the newly released products.